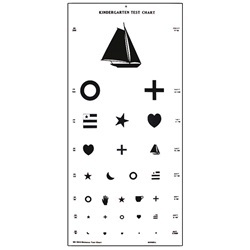 Kindergarten Test - 20 Foot, 11" x 22.5"
Single-sided Kindergarten chart uses various simple symbols for pediatric testing. 20/200 to 20/20 acuity measurements. Measures 11" x 22.5". Hold 20 feet away. Made from translucent, washable plastic. Manufactured by Bernell. Comes as singles.